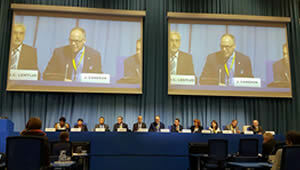 In October 2018, in Vienna, the International Atomic Energy Agency (IAEA) hosted the International Symposium on Communicating Nuclear and Radiological Emergencies to the Public, bringing together 400 participants from 74 Member States to discuss challenges and identify key priorities in improving strategies for effectively communicating with the public before, during and after nuclear and radiological emergencies. The CNSC’s Jason Cameron, Vice-President of Regulatory Affairs and Chief Communications Officer, served as symposium president. The final report of the symposium is now available online. This informative document is a thorough summary of the symposium, with narratives covering all presentations, panels and poster sessions. It includes Mr. Cameron’s recommendations aimed at improving how officials around the world and at all levels communicate to the public during a nuclear or radiological emergency. It is important to have established principles and practical arrangements for emergency public communication, and necessary to have best practices reflected in the international safety standards. It is important to be prepared in advance (e.g., know roles and responsibilities, have developed and tested materials, and identify and engage stakeholders). Continuous learning through workshops, training and exercises was stressed, including the need for technical experts and communication experts to be trained together. It is important – yet difficult – to answer the question "Am I safe?"" Clear and empathetic language that puts radiological health hazards into perspective and relays reliable information builds trust, allays fears and helps to avoid unwarranted actions. To underpin these efforts, there is a common need to prepare emergency preparedness and response communication materials that people from a broad diversity of cultural, educational and linguistic backgrounds can understand. Innovations in media are fundamentally changing communications practices. In particular, social media has grown in reach and influence. These trends are expected to continue to grow in strength, thus the role of public information officers and nuclear communicators in ensuring effectiveness and transparency in emergency communications is essential. Communications must be a key priority. Not only should there be further international meetings and workshops on the subject, but communications should also be included at relevant national activities related to emergency preparedness and response. It is now up to Member States and the IAEA to implement these recommendations and share progress at future international events on emergency preparedness and response. The CNSC commits to implementing these recommendations and sharing best practices, and to continue learning from our international peers. Providing leadership on global nuclear issues like the importance of effective public communication in an emergency is one way that the CNSC is working to help keep Canadians and the world safe.